It's raining. Again. And I have finally realized that spring won't come this year. What a shame. But what to do if not take matters in own hands, and create some spring inside? So today I'm making paper flowers. Tissue paper in two colors. You need enough to make three squares that are 15 x 15 cm (6 x 6 inches) in each color. I used one 50 x 70 cm (20 x 28 inches) paper and cut it in six squares. Put the three squares in each color on top of each other. Fold in half (each color separately). And fold to a cone shape. 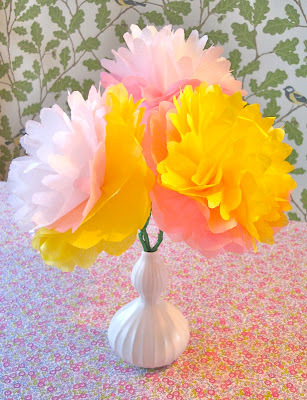 Cut the base petals like this. Cut the upper petals like this. Unfold (but do not flatten!) the petals. Starting with the base ones - one layer at a time - connect with a little glue dot in the middle. Put the upper petals on top of the base ones, one layer at a time. 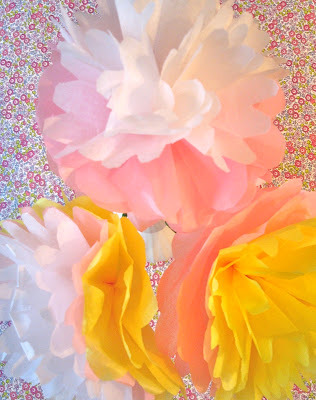 Press with your fingers at the glued area, shaping the petals like an umbrella. Take a wire piece (this will be the stem) and insert through the glue. Form a small hook at the end inside the flower to prevent it from slipping out (I have no pictures of this, but you'll get it, right?). Keep pressing with your fingers until the glue is dry(ish). Take a new piece of wire and twist it tightly where the flower meets the stem. Continue twisting the wire down the entire stem. Carefully separate each layer, forming the shape of the flower. Cut a 2,5 cm (1 inch) wide piece of the crêpe paper. Twist it tightly around where the flower meets the stem, use a little glue to secure it. Continue wrapping the entire stem. Secure at the end with a little glue. Summary in Swedish: Idag har jag gjort papperspioner. De är enkla att göra, och vackra! Du behöver silkespapper i två färger (tre fyrkanter om 15x15 cm i varje färg), grönt crêpepapper (en remsa som är 2,5 cm bred), papperslim och ståltråd. Lägg ihop fyrkanterna i varje färg separat och vik som på bilderna ovan. Klipp de yttre kronbladen som den rosa mallen och de inre som den vita mallen. Följ bildinstruktionerna, säg gärna till om något är oklart! Lycka till!